Two people are found by the police in a hotel room in the European countryside. One of them, a photographer called Arjun Joseph (Tony Luke Kocherry, credited here as Tony Luke), is lying dead, while the other, the renowned businessperson Naina Sethi (Taapsee Pannu) is injured. The woman claims that there was an unidentified third party within those four walls with them, although no one was seen leaving and all possible exits were in any case secured from inside. Her guilt as a murderer is therefore assumed, but Ms Sethi will have none of that. She hires an expensive lawyer called Badal Gupta whose expertise in ‘preparing’ witnesses is legendary in legal circles since he has not lost a single case in a 40 year career. His mantra: “Kanoon wahi sach maanta hai jo saabith kiya ja sakta hai.” (The law believes to be the truth that which can be proved.) Badla begins with this tall, bearded man (Amitabh Bachchan) arriving for a meeting with Sethi to hear her account of events. The narrative unfolds in a series of flashbacks as she tells him what transpired between her and Joseph. Writer-director Sujoy Ghosh’s Badla (Revenge) is the Hindi remake of the Spanish crime thriller Contratiempo a.k.a. The Invisible Guest, written and directed by Oriol Paulo, and currently streaming on Netflix. The adapted screenplay – replete with references to the Mahabharat – has been attributed to Ghosh while Paulo has been duly acknowledged as the writer of the original story in the Hindi film’s credits. Contratiempo and Badla belong to the sub-genre of thrillers where the viewer hears several versions of the truth narrated by various people, some who have credibility because they were present at the site and some who may not necessarily have been there. If you are listening and watching carefully enough, you may spot at least two gaping loopholes much before the big reveal. This is a fault of the written material by Paulo, not Ghosh’s direction or the acting. For instance, the story is pivoted on the extreme and uncharacteristic inefficiency of one of the individuals involved, and calls for considerable suspension of disbelief from anyone who notices this flaw. Ghosh’s direction is, in fact, efficient as is Monisha R. Baldawa’s editing while they aim at having us guess who is to be believed and who not. Badla’s DoP is Avik Mukhopadhayay whose work on Shoojit Sircar’s October last year was sheer genius. Here he gives us elegant shots of Scotland’s natural beauty along with cleverly chosen frames featuring the various players in this psychological cat and mouse game between the storyteller and the audience. The end result is a satisfying whodunit which, while certainly not brilliant, is suspenseful enough and occasionally eerie enough, especially when outdoors, to be entertaining while it lasts. Pannu, like the film, is effective but not great. So is Bachchan. The handsome model turned Malayalam film actor Tony Luke (Oozham, Sakhavu) makes his Hindi debut with Badla, and delivers the most impressive performance of the lead trio. As is expected in such films, with each retelling of the goings-on between Sethi and Joseph their characters change, sometimes marginally, sometimes dramatically. This good-looking young star lends subtlety even to the dramatic transformation in Joseph in one of the versions. I also love the fact that he does not camouflage his Malayalam accent when he speaks Hindi here – an interesting choice by the actor and his director. Amrita Singh has a crucial role in the film. Playing a distraught mother, she gives her character a convincing emotional graph as demanded by the screenplay without once devolving into Bollywood’s stereotypical over-wrought Maaaaaa. Sujoy Ghosh is a leading light among thriller makers in Bollywood. His Kahaani (2012) starring Vidya Balan set new standards for the industry in this area. The pressure to live up to expectations raised by that film did show in the writing of the climax for Kahaani 2 (2016), but he reminded us of his unmistakable talent for mystery with director Ribhu Dasgupta’s unfortunately underrated Te3n (2016) starring Balan, Bachchan and Nawazuddin Siddiqui, which he produced. 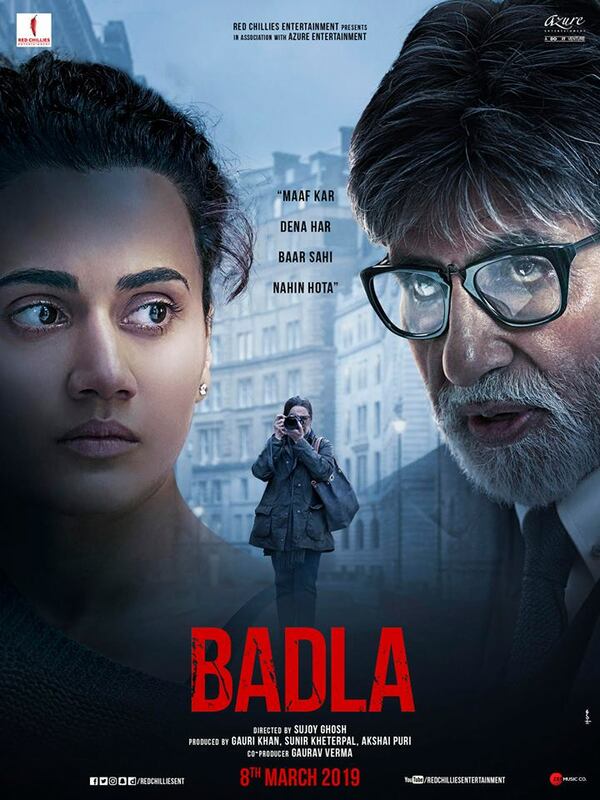 Maybe some day he will replicate the brilliance of Kahaani, but today what he has given us is Badla: if you are not in too demanding a mood, this is an enjoyable film.